We’ve used our International SEO video in the examples below to show how easy it is to create clickable links in a Youtube video. LinkedTube makes it very easy to add a call-to-action button in the top right corner of your video. It also enables you to use different messaging to complete your call to action. The button text is your main message, but when a visitor hovers over the button, they’ll see two more short messages of your choice. This gives you a little more flexibility in grabbing the visitor’s attention. First, let’s look at a screenshot of the LinkedTube interface. As you can see, you simply input the information requested in the short form, preview the results, and grab the embed code. And here is the final result. Notice the button in the upper right corner? Be sure to hover over the button to see the two extra lines of text that show up, and of course, click it to see that it actually works. Mozilla Popcorn has a lot more features and enables you to do some really amazing things. For the purposes of this post, we’ll simply add our clickable call to action, but feel free to delve into all the rest of Popcorn’s capabilities. 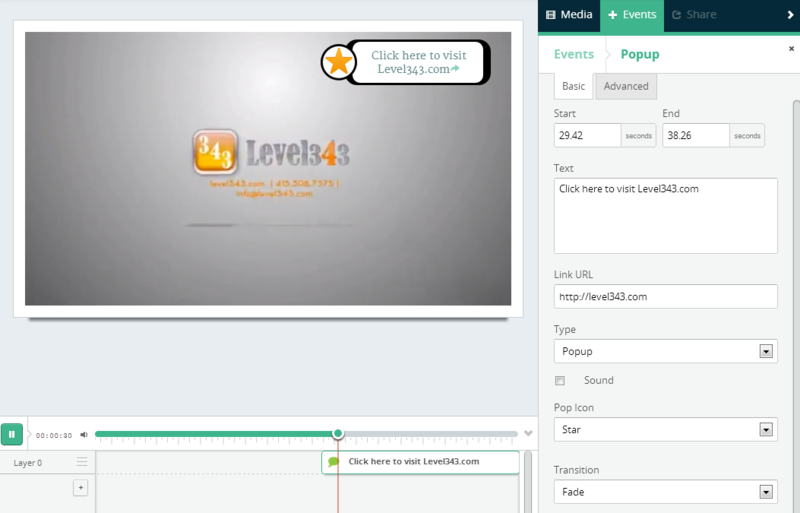 Popcorn uses the familiar movie editing timeline, enabling us to attach “events” to any portion of the timeline. We’ll use the Popup event near the end of our video, but we could add other events throughout the video. For now, let’s see what the interface looks like. And here is the result of our little Popup Event test. To see an example of all the cool things Popcorn can do, check out the sample video below. I personally like LinkedTube’s method best, but Popcorn definitely has some interesting features as well. Which do you like best? Both of these methods are free, by the way, and I’d bet there are others I don’t know about, so please share if you know of alternate methods.